Why shop with Just Jewellery? Just Jewellery is one of Australia's original and largest online jewellery stores for fine jewellery and fashion jewellery. Our mission is to provide stunning and fashionable designs that are as unique as you are! We stock a range of eye catching pieces from gold and sterling silver, to precious coloured stones, diamonds and pearls, crystals and CZs - our extensive range has something for everyone! 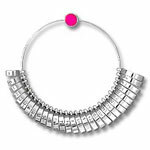 Our jewellery is made to a high standard and most comes with a no questions asked 10 year manufacturers warranty. And we offer a 30 day money back guarantee. You can't ask for more than that! With more than 1000 products Just Jewellery can help you find the perfect gift in our Australian online jewellery store. And we are adding new items all the time! With so much to choose from check out our Shop by... searches to help you find the perfect gift. We are dedicated to supporting cancer survivors through awareness and various charities. We appreciate all of you who support us in this endeavour. Together we can make a difference.